The time of year has come round again when I spend hours trawling my favourite online retailers for the items I’d love the most for the new season. I won’t lie, for some reason I found this season a lot more difficult to find things that are my taste than I have in the past, and I don’t know whether that’s just because the collections aren’t as good, or my style has evolved. You can definitely see that there’s a theme (and a significant lack of colour!) but the colours I did see just weren’t for me. 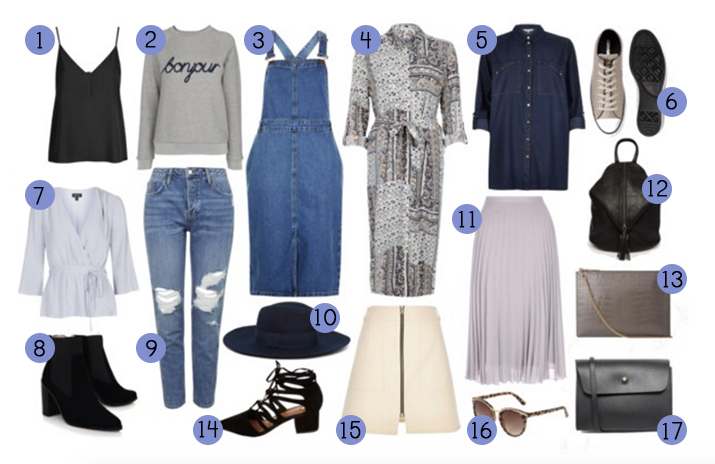 I’m not a pastels girl and I’m not the biggest fan of brights; only a select few, so it’s no surprise that this year my Spring fashion wish list is full of my failsafes – all things grey and denim! My list is made up of a mixture of midis, minis, skirts, dresses, jeans, camis, shirts and blouses; something for any occasion, and the shoes and bags to go with them (If only I could click my fingers and this would all appear in my wardrobe)! I’ve cheated a little here and included the denim dungaree dress that appeared here on the blog last week, but I just love it so much and it kind of pulls everything in the list together. Other denim must haves making the cut are the Hayden jeans from Topshop that are great rolled up and worn with stilettos, or dressed down with Converse like the grey pair at number six. Then theres the oversized denim shirt that would be great worn as an overshirt with the black cami at number one, or tucked in to the cute zip up mini skirt at number 15. One of my favourite pieces on the list is the printed midi dress, which would be great for work or play in the Spring time, teamed with the black ankle boots and rucksack. I also love the grey pleated skirt that would be dreamy on a sunny day. I’d style it a little differently to the norm, with the Whistles sweater and some chunky heels, and the tortoise shell sunnies for good measure! I can’t wait for the weather to warm up so I can start to add a few new pieces to my wardrobe. What’s on your Spring wish list? "HOUSE TOUR | A LOOK INSIDE OUR LIVING ROOM"
I love the 'Bonjour' jumper, I'm really feelin' slogan tops at the moment! I have far too many but just can't stop buying them! I have 'Bien', 'Very Bien' and 'Excusez-Moi', so 'Bonjour' is just naturally the next thing I should have, right?